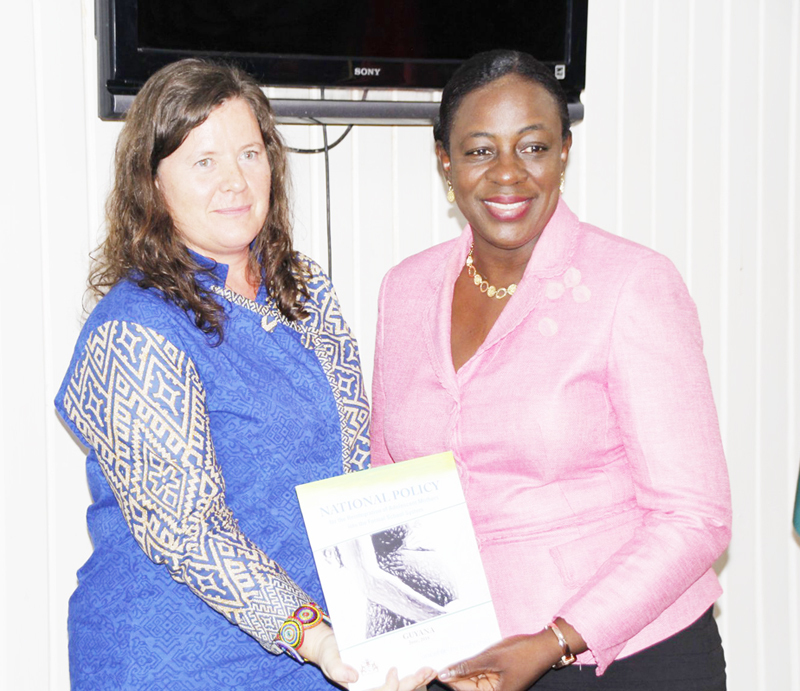 Minister of Education, Nicolette Henry (r) receives the manual from UNICEF representative to Guyana and Suriname, Sylvie Fouet. The policy manual was handed over Monday at the National Centre for Education Resource Development (NCERD) by officials from the Ministry of Education and the United Nations Children’s Fund (UNICEF). The policy had the input of other important stakeholders such as the Ministry of Public Security, Ministry of Health, Ministry of Social Protection and faith-based organisations and other agencies. First Lady, Mrs. Sandra Granger, called on the policymakers and educators to uphold and protect the rights of children and adolescent mothers who have suffered sexual abuse. According to Minister of Education, Nicolette Henry, teenage pregnancy is a complex issue, which results from a number of factors. These can be poverty, gender inequality, violence, lack of education and difficult relationships with parents and family members. She said this must not prevent them from acquiring education. “As the government, our motto is that every child matters. With this policy, there will be no need to repeat the past because the future for adolescent mothers in Guyana will become bright. Legally, the barriers that prevail will be a thing of the past and indeed illegal,” Minister Henry told officials present. UNICEF representative to Guyana and Suriname, Sylvie Fouet, said Guyana ranks the second highest in teenage pregnancy in Latin America and the Caribbean. She said the creation of the policy is a key milestone and the next step is implementation. She signaled that opening the doors is not sufficient, and communities and stakeholders need to understand and be supportive and knowledgeable of reproductive health in Guyana. “They need to know that they are protected and they are cared for so all the supportive mechanisms like education, health and justice have to support that and we hope. We wish the best for Guyanese, particularly the youngest,” Fouet said. The policy has been in the works for approximately one year and sets out clear guidelines to ensure that mothers are not denied the opportunity to re-enter the formal school system, to continue their education. It aims at not only managing the reintegration of the adolescent mothers but it is also to advance the prevention of adolescent pregnancy.